I have been a fan of Chef Fabio since he made his television debut on Top Chef! Therefore, I was excited to learn that he has just launched his first product line, the Fabio Viviani Comfort Mats by Smart Step Home! Cooking and baking all day can leave even home chefs with tired, aching feet, legs and back. The solution is the Smart Step Home- Fabio Viviani Comfort Mat which is designed with special engineering to make cooking a more comfortable experience while relieving muscle aches from standing for long periods of time. The Comfort Mat features trip-proof beveled edges and SmartTech Polyurethane material that is so durable it is heat, tear, puncture resistant. I love that I never have to worry about it curling or wearing out so it should look just as good a year from now as it does when it is new. I put the Mercato Comfort Mat ($99.95) to the test in my kitchen placing it in front of our stove where I stand the longest when prepping and cooking three meals a day for my family. 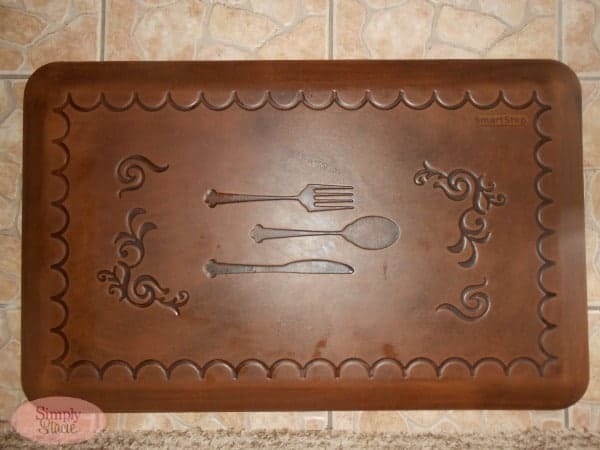 This mat is extremely comfortable to stand on as it cushions the feet beautifully…..even my husband tried it out and loved it (maybe he will be willing to do more cooking)! I am tall so I have a tendency to slouch and I like that this seems to help me keep proper posture when standing on it too. I have had several spills including hot water from cooking pasta and it didn’t damage the mat all. It is very easy to clean up too as it is designed specifically to be spill resistant. I love the chic Italian inspired design of the Mercato Caramel Comfort Mat (available in Mercato, Toscana and Fleur-de-lys) that is a lovely addition to my kitchen décor. The flatwear design with lyrical accents is lovely and the caramel color is rich and classic. It is obvious that this product was designed with the same passion that Top Chef Fabio Viviani puts into his cooking! You are invited to visit Smart Step Home to shop the Chef Fabio Viviani Comfort Mats collection. Which design would look best in your kitchen? I highly recommend the Comfort Mats from Smart Step Home for anyone looking for the ultimate comfort experience! I like the Mercato Caramel the best. I really like the 3′ Fleur-de-lys Burgundy .